There was a great turn-out today, for the Axedale Australia Day Breakfast, held at the Community Park in Axedale. The Australian Flag of course, was proudly flying. Members of the CFA had the barbie going flat out, cooking the sausages. These were free to all, and free tea and coffee was provided in the hall. The CWA Ladies were selling their home made lamingtons, and I noticed that they didn’t last long very long at all. Axedale’s very popular choir, Axedale in Harmony sang Advance Australia Fair and other well known Australian songs. The words were given out, so we could all sing along. The local community awards were announced to much cheering of the popular recipients. Citizen of the Year was given to NORAH RIGBY, who is the editor of the local newspaper, The Axedale Antics. This award was very well deserved, as Norah devotes a huge amount of time on both content and publishing. Norah is also involved in many other community events. Young Citizen of the Year went to twelve year old ZARA SMITH who has devoted the past couple of years to fundraising for The Heart Foundation Zara is a very impressive young person with a maturity well beyond her years. The Community Award went to owners of Axedale Tavern, Corinne & Garry, recognising the amount of time they give to local community and fundraising events. The CWA Youth Encouragement Award went to 17 year old athlete, CHRIS BROWNE. Chris is achieving great things in athletics with more to come in the future. Congratulations to all the award winners. It was amazing to hear about the the amount of work they do, and the precious time they devote to the Axedale community. Here they are with Councillor Rod Campbell who represents the Eppalock Ward, and Yvonne Wrigglesworth, President of Axedale Our Town Our Future. 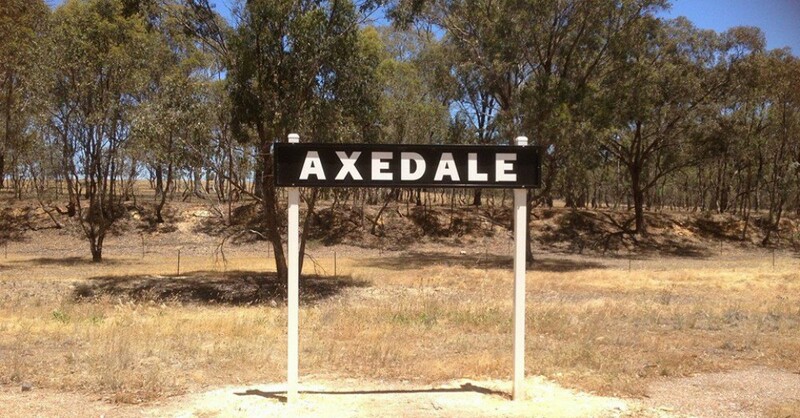 In the centre of the photo is Axedale’s very popular Mascot, Axel. Local resident, Terry, celebrating Australia Day in his best Ozzie gear.